The recent bankruptcy filing by Westinghouse is impacting multiple utilities including Santee Cooper, SCANA, and Southern. Nuclear power plants under construction in Georgia and South Carolina are at risk as a result of the bankruptcy. SCANA and Santee Cooper are analyzing how to proceed but appear prepared to continue the projects with other contractors. The additional project risks have caused yields to rise for Santee Cooper's municipal bonds. 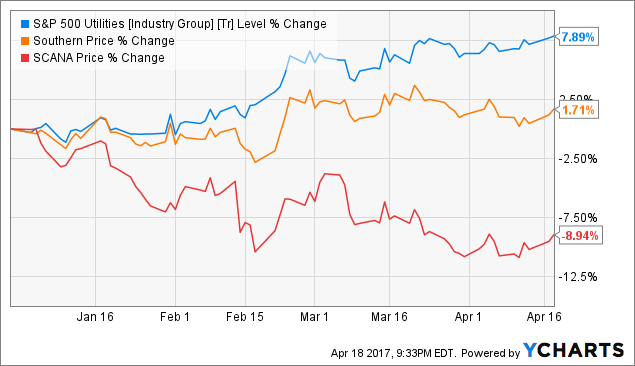 Meanwhile, Southern and SCANA's stocks have underperformed the S&P 500 Utility index for the year. The recent bankruptcy filing by Westinghouse is causing problems for several utilities including The Southern Company (NYSE:SO), SCANA Corp (NYSE:SCG), and Santee Cooper, South Carolina's electric utility municipality. The issue arose because Westinghouse was responsible for constructing and starting up the units for nuclear plants under construction in Georgia for Southern and a joint venture in South Carolina for SCANA and Santee Cooper. The future of these partially built plants are now in question. To make matters worse, there were guarantees made by the parent of Westinghouse, Toshiba Corporation (OTCPK:TOSBF) (OTCPK:TOSYY), to pay damages if Westinghouse failed to meet schedule deadlines and performance guarantees. Those guarantees would carry more weight if Toshiba wouldn't have recently warned it might not be able to continue as a going concern. Now the utilities are analyzing how to move forward. In SCANA's March 29th investor call, management indicated their initial evaluation period would take 30 days. 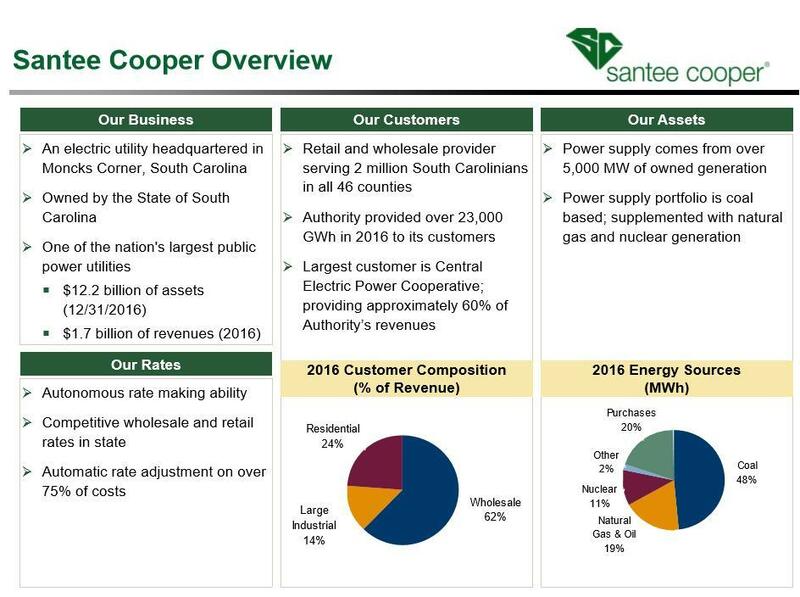 Santee Cooper released an investor presentation on Wednesday to address investor's concerns. The stocks of Southern and SCANA have unperformed the broader S&P Utility Index for the year but my attention has been on the increase in yields for Santee Cooper's municipal bonds. The South Carolina Public Service Authority (Santee Cooper) was created by the State to produce and distribute electricity and water. It is one of the largest municipal utilities in the U.S. and serves approximately 2 million residents of South Carolina. The utility is owned by the State of South Carolina (Aaa/AA+/AAA) but the State does not guarantee Santee Cooper's bonds. Santee Cooper's power generation fuel source is dominated by coal and natural gas. 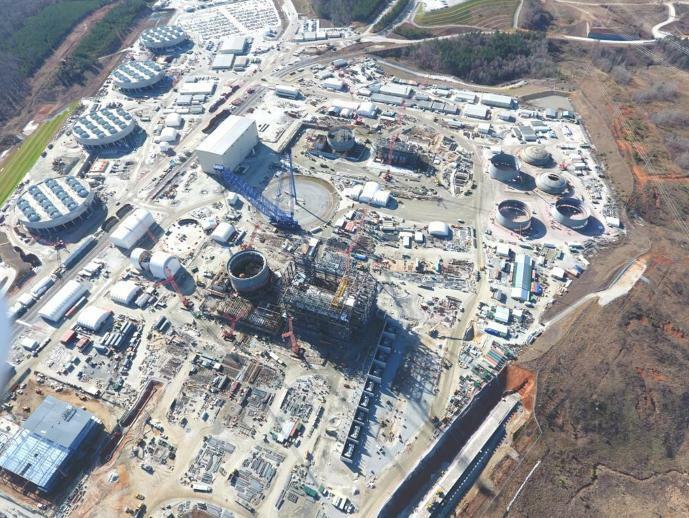 Santee Cooper has a joint ownership agreement with South Carolina Electric & Gas (SCANA) to own and operate the Virgil C. Summer Nuclear Plant. The first nuclear unit came online in 1983 and SCE&G has a two-thirds ownership of that unit while Santee Cooper owns the other third. 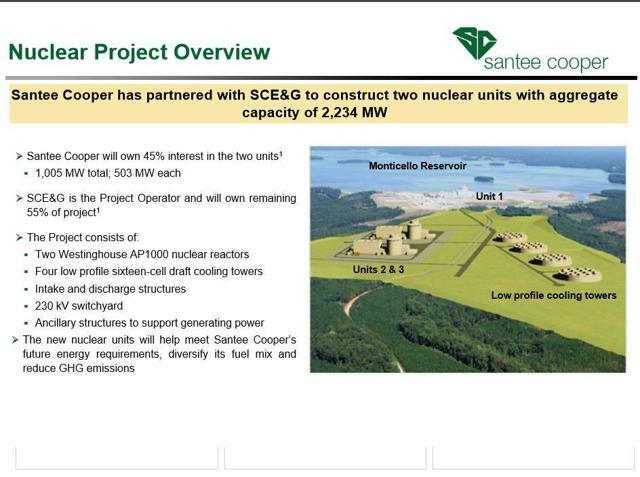 In an effort to diversify away from carbon based fuel sources, Santee Cooper agreed to expand the plant in 2008 with SCE&G by building Summer Nuclear Units 2 and 3. These are the units that were being built by Westinghouse. These units were expected to boost the nuclear energy source to over 40% of Santee Cooper's power generation. Summer Units 2 and 3 are 45% owned by Santee Cooper and the remaining 55% owned by SCE&G. As for the project status, most of the engineering and procurement is completed but the construction was only 31% complete as of the end of 2016. Total cost of the project rose from $5.1 billion to $6.2 billion of which Santee Cooper is responsible for 45% or $2.79 billion. The Westinghouse bankruptcy is expected to increase costs further and create more delays. Additional bonds will need to be issued to complete the financing of the plant. How will SCANA and Santee Cooper Proceed? 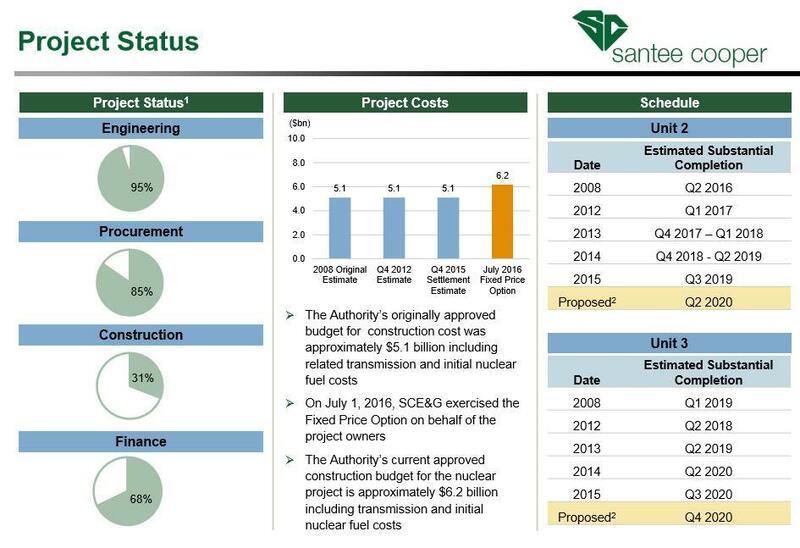 Based on the Santee Cooper investor presentation and SCANA's investor call, their preference seems to be to continue with the project. Even if they decided to scrap the project, there will still be a need to meet future demand for power if not by nuclear power then by another source. Santee Cooper says they can weather additional delays and additional costs can be passed through to customers. There is also the potential to recover costs from the guarantees made by Toshiba. Based on the scenario analysis outlined below, a cost increase of $2.25 billion would have minimal impact on their debt service coverage due to rate increases. Likewise, scrapping the plant does not materially change coverage the other way. 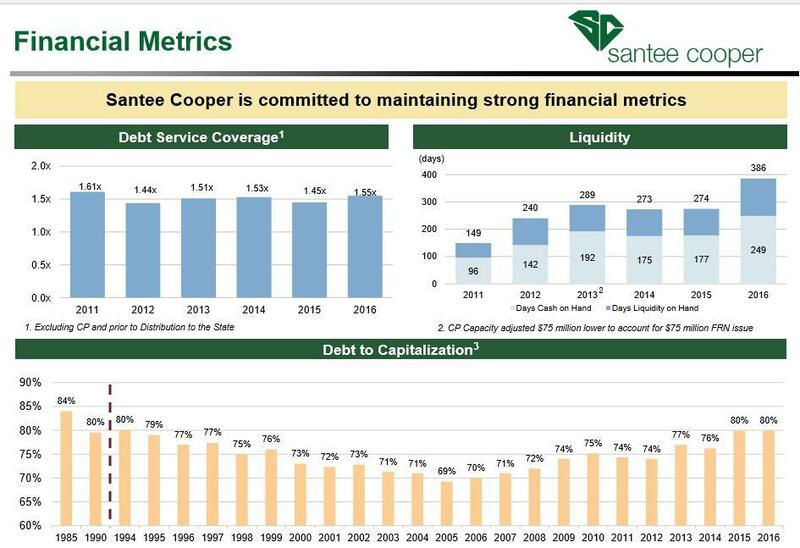 As for their financial metrics, Santee Cooper has averaged about 1.51x debt service coverage over the past 6 years. This is not what I would consider a strong level of coverage but the utility does have rate setting authority and a monopoly on their service area. They also have good liquidity for a utility with 249 days cash on hand. Yields Rise on Fears Santee Cooper Could be the next "Whoops"
There are similarities between the problems Santee Cooper has experienced and the Washington Public Power Supply System (WPPSS) faced with their own nuclear plant construction in the 1980s. Cost overruns, delays, and cheaper alternative fuel sources to name a few. WPPSS later became known as "whoops" by the locals when the utility defaulted on $2.25 billion in bonds. I don't view the Santee Cooper situation as that dire at this point. 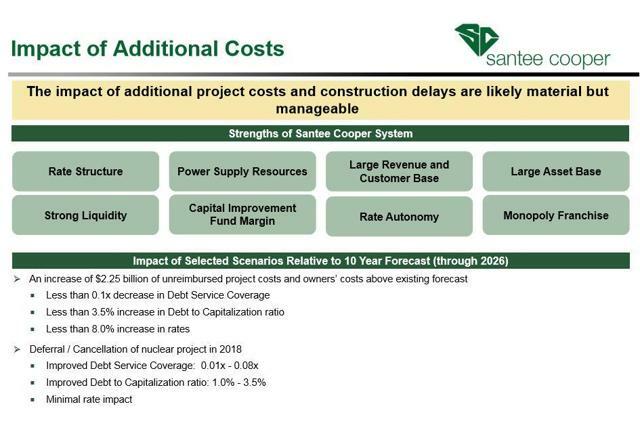 There are certainly substantial project risks to be concerned with and it appears likely Santee Cooper will be downgraded by the rating agencies. 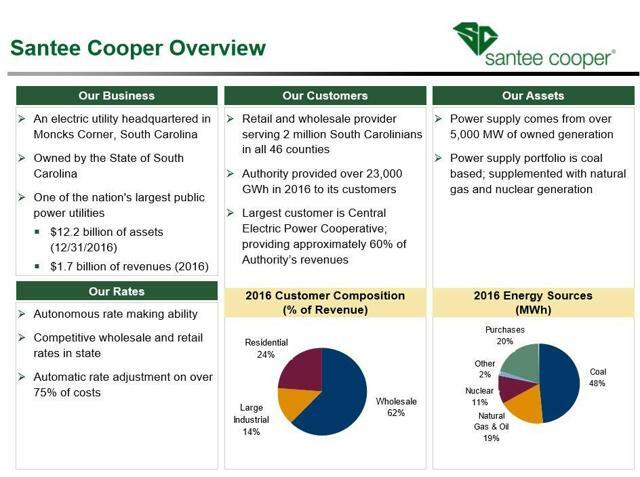 Santee Cooper is currently rated A1 by Moody's, AA- (negative outlook) by S&P, and A+ (negative outlook) by Fitch. I would expect the rating agencies to announce their rating action once more details are released over the coming weeks. Santee Cooper needs to maintain an investment grade rating to be able to continue accessing capital markets for additional debt issuance. By being transparent with the actions they are taking, this will help investors and the rating agencies assess the ongoing situation. By sticking with shorter maturities, credit risk and duration risk is reduced. The debt service coverage is ample at 1.5x, the utility has good liquidity, and have automatic rate increases with additional authority to raise rates if needed. The 4% 12/1/20 bond (CUSIP: 837151DP1) is offered around 2.2% but traded as high as 2.76% following the Westinghouse announcement. A 2.2% yield is a 3.38% tax equivalent yield at a 35% tax rate. By comparison, SCANA's 4.75% 5/15/21 bond is trading at 3.4% but the SCANA bond is rated Baa3/BBB/BBB- and is likely going to be downgraded to junk as all of the rating agencies have them on negative outlook. Outside of Illinois, Puerto Rico, and New Jersey there aren't many tax-exempt muni bonds trading above 2.2% for 3-4 years. The longer bonds are where the muni yields really beat corporate bonds due to the tax-exemption. Many of the longer callable Santee Cooper bonds have call dates in the 2022-2026 range with final maturity dates ranging from the late 2030's through the 2050's. Quite a few of them have 5% coupons and are offered at yields above 4%. A 4% yield provides a tax-equivalent yield of over 6% at a 35% tax rate. By comparison, SCANA's longest bond matures in 2065 and yields just 4.75%. The longer bonds are not likely a fit for an individual but rather an institutional investor with a long time horizon. It will be quite a disappointment, especially for proponents of nuclear power, if these power plants are not completed. South Carolinians are not going to be very happy either to see their money poured into a failed power project that they are left on the hook for. Uncertainty always spooks markets but the Santee Cooper bond yields seem a bit overdone, especially on the shorter bonds. If you found this article helpful, please click the follow button to be notified when my articles are published in the future. I welcome all questions or comments below.